Angel, Islington can be found on the northern fringes of Central London. It’s relatively close to the main hub of activity, but far enough from the city centre to have its own personality and be free from too many tourists. Positioned on the Northern Line between Old Street and King’s Cross, Angel attracts a blend of creatives and city types and caters to just about everyone with its assortment of bars, restaurants, shops and entertainment venues. If you’re looking for a place in London that’s cool, well-heeled and not ludicrously expensive, here’s everything you need to know about Angel. Angel’s central location makes for an easy and pleasant walk into central London, Shoreditch, Bloomsbury and Camden. However, local transport links are always an essential consideration when deliberating where to live in the capital, so it’s good to know that Angel absolutely delivers. As mentioned earlier, Angel has its own Underground station, which is on the eastern branch of the Northern line. This takes passengers north, to the hub of King’s Cross, and south, to Old Street, Moorgate, Bank and London Bridge in just a few minutes. If the Overground or Victoria line are more convenient, Highbury & Islington station is located at the northern end of Upper Street, and there is a multitude of buses available to take you all over the city. 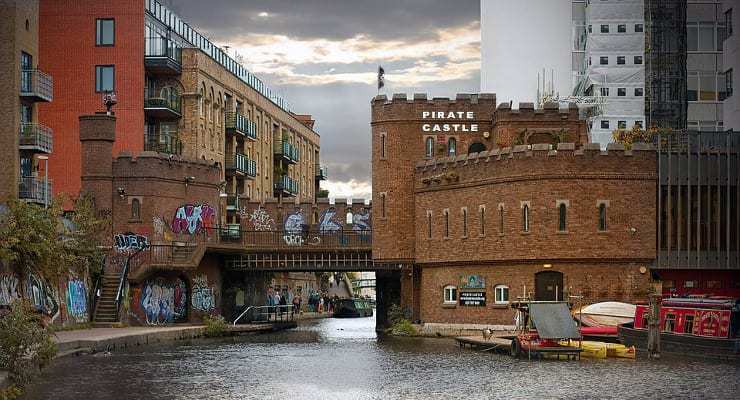 If you’re open to a more leisurely route, a stroll along Regent’s Canal through Camden and into Regent’s Park is the perfect activity for a sunny day. Upper Street is the home of what seems like every respectable chain restaurant under the sun. As you head north from the station, you’ll find Pho, Byron, The Breakfast Club, and Chipotle before you even reach Islington Green. Carry on a little further and you’ll pass Wahaca, Five Guys, Nando’s, Carluccio’s, MEATliquor and Ottolenghi. Prefer something a little more unusual? For light bites, look for Kipferl coffeehouse, where you can enjoy specialist coffees with authentic German and Austrian pastries and small plates. Alternatively, you could try and squeeze into Afghan Kitchen, which serves simple, hearty Afghan cuisine just off of Islington Square (just remember to bring cash as they don’t accept cards!) Le Mercury has excellent French dishes at very reasonable prices, or there’s Gallipoli Bistro, offering Turkish mezze and grill dishes that are so popular the owners had to open a second venue (called simply “Gallipoli Again”) just up the street. Islington boasts a trendy-yet-sophisticated nightlife that attracts visitors from all over London. Head to Dead Dolls House if it’s DJs you’re after, or check out what live music is on at the O2 Academy in the N1 shopping centre. Cocktail lovers can indulge at John Salt, Upper Street, while craft brew fans will appreciate the Brewhouse & Kitchen on Torrens Street. Both venues are perfect for taking your evening into the night, complementing their drinks offering with excellent food menus. See more of Angel’s best bars listed here. The diversity of Angel’s residents translates into a pretty fantastic shopping scene. Staple high-street names can be found in and around the N1 shopping centre, making it entirely possible to get a spot of retail therapy in on your way home from work. If you like the bustle of a market, Chapel Market hosts vendors every day of the week, mainly selling fresh fruit and veg, along with some household supplies. The scene changes slightly on Sundays, as the Islington farmers’ market takes over with its offering of locally grown organic produce. Looking for hidden gems? Locals will tell you (or maybe they won’t) about Camden Passage, a small, pedestrianised area tucked behind Upper Street. It’s home to some of London’s best vintage shops, selling eclectic, antique furniture, retro clothing and bric-a-brac. Not satisfied with great food, shopping and nightlife? Screen on the Green is the local independent cinema, and its fantastic retro-inspired signage advertising new releases and cult film showings throughout the week. Theatre-lovers should book a seat at the Almeida Theatre, which is internationally recognised for attracting big-name actors and staging productions that are so successful they eventually move to West End venues. More of a comedy enthusiast? Take a look at The Hen & Chickens, a fringe theatre bar that has hosted the likes of Jimmy Carr and Jack Whitehall, or the open-mic nights that are held every night at the Camden Head. Okay, about that “ludicrously expensive” thing we said earlier – don’t get your hopes up. We’ve explained how fantastic Angel is, so it shouldn’t come as a surprise that the comfortable life it offers still comes at a price – it’s just not quite as steep as those further west. Expect rent for a two-bed flat to be at least £2000pcm, but considerably more if you’re looking at living in one of the beautiful Georgian terraces rather than a tower block. Squeezing into a 1-bed will save you a bit of money (rents start from about £1500pcm), or you can typically find better value per room by moving into a 3 or 4-bed flatshare. As with renting anywhere in London, make sure you go through a reputable property management company (such as local firm Peter Barry) – scams are not uncommon and it’s a lot of money to lose. The average property price in Angel is currently £850,000, with 2-bed flats available from £500,000. Again, moving to a 1-bed might save you some money but a 3 or 4-bed property (even a flat) is going to push the price over the £1,000,000 mark. However, in exchange you will be able to choose from a diverse range of period homes, listed buildings and converted factories with unique character. Ultimately, these prices put the rent in Angel at about 50% higher than the London average, meaning that you need a pretty healthy budget to cover your living costs, even by London standards. Sam Singh, Founder of Triplerr – How will Brexit effect UK House Prices?